The French Far Right and Génération Identitaire. “The Identitarian movement is a pan-European socio-political movement that started in France in 2002 as a far-right youth movement deriving from the French Nouvelle Droite Génération Identitaire. Initially the youth wing of the anti-immigrant, far-right Bloc Identitaire, it has taken on its own identity and is largely classified as a separate entity altogether with the intent of spreading across Europe. The Identitarian movement advocates rights for members of specific European ethnocultural groups.” Wikipedia. 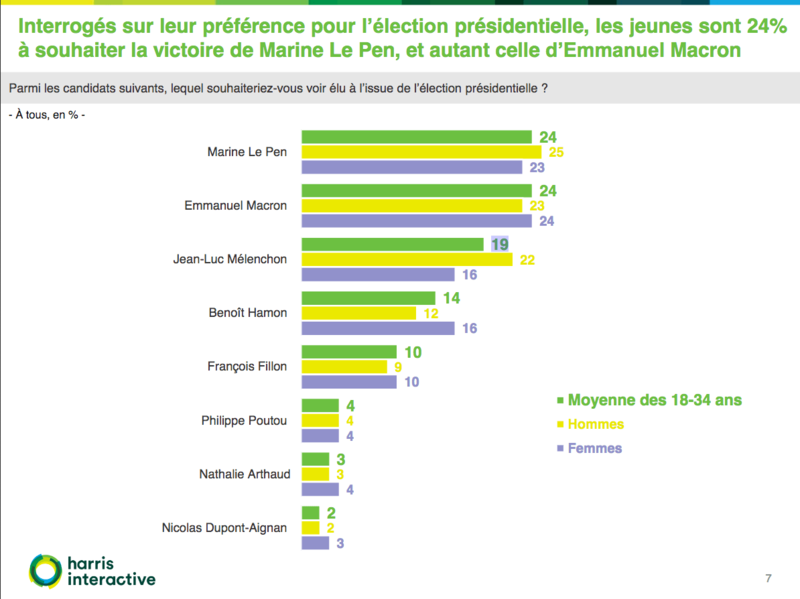 Marine Le Pen’s far right Front National party is reckoned to be the most popular amongst young people, with as many as 40% of 18 to 24 year olds backing her. Now a far-right youth movement is emerging from the shadows. It is called Generation Identitaire and it’s proposing controversial solutions to France’s social problems. They also interviewed Renaud Camus whose views on the “grand remplacement“, that is the replacement of the European Population by non-Europeans, has its roots in conspiracy theories that claim this is an organised process by “élites politiques, intellectuelles et médiatiques”. There was no reference to the mountains of criticisms that have been made of Camus’ ‘thesis’: from Hervé Le Bras onwards (see: here). Génération Identitaire claims to be the barricade raised by young people to struggle for their identity, the vanguard of youth. The wider Bloc Identitaire has around 2,000 members, and 600 activists. Génération Identitaire has a lot less, in the low hundreds. The use of the term “identity”, is both a reflection of the confusion of ‘identity politics”(if every group has to go back to its roots, why not the ‘French’? ), and the long-standing opportunism of the French Far-right, which trawls through every possible popular theme in order to appeal to a potential audience, and never forgets to add an intellectual gloss to its propaganda. Thus we have “nationalisme révolutionnaire“, groups which refer to, amongst others, Blanqui, Proudon, Sorel, Gregor and Otto Strasser, nad have admired, at various time, Hugo Chavez, Fidel Castro and Iranian strong man Mahmoud Ahmadinejad. We also have, probably the biggest confusionist site of them all, Égalité et Réconciliation, which claims to stand for the Left on Work and the Right on Values is opposed to globalisation, and pitches much of its appeal to ‘an ‘anti-Zionist’ constituency. It is closely linked to the anti-Semite, Dieudonné. The Front National’s appeal to the Sovereignty of the Nation is also intended to extend across classes and politics, and has succeeded in drawing in some (formerly ‘left-wing’) sovereigntists who agree that France must stand against the EU, Globalisation and Cosmopolitanism. The report talked of young people’s support for the far-right. This is a problem, though it is channeled into voting for the Front National rather than the groupuscles like GI. In examining these figures Jean-Laurent Cassely suggests that while young people generally have more liberal values than their elders, for the minority who do not hold them, the FN is appealing. That while there are fewer and fewer conservative voters those that are have moved further to the right, and that those too young to have memories of Marine Le Pen’s openly extreme father, Jean-Marie, are more inclined to cast their ballots for the FN. Others look to the correlation between youth unemployment and support for the far-right. The poll does show however that the total of young people backing left candidates, collected together, stands at …40%! With 24% supporting the ‘centre’ Macron. Channel Four mentioned protests against Génération Identitaire‘s Lille operation, but did not cover their ampleur, nor just how widely this was reported. The far right group planned to open a bar to act as its headquarters in the northern city of Lille on 24 September 2016. Located just 200 metres from the Grand Palais, it will contain a boxing gym, a cinema a level advice centre, and a library. Aurélien Verhassel, the group’s local leader, said it would open only to ‘Europeans of French spirit, heirs to the Helleno-Christian civilisation’. Locals launched a petition to block the bar, called La Citadelle, citing concern that it ‘will propagate hate and cause incidents that are beyond control’. The petition had gathered more than 60,000 signatures by the 24th, but the Citadelle’s inauguration went ahead as planned with 30 members of the group present. Around 500 protesters, many of them supporters of the far-Left, marched behind banners with slogans such as ‘No fascists in our districts’ in an attempt to stop the bar’s official opening on the evening of the 24th. In November 2016, demonstrations against the bar were still taking place. On the 19th, protesters had gathered between 600 and 1,200 people in the streets and 70,000 signatures against the bar on their online petition. More simply: A Lille, des centaines de personnes réclament la fermeture du bar d’extrême-droite La Citadelle. Le Monde. The Channel Four reporter’s reference to “tous les mosquees” instead of toutes les Mosqusées suggests an imperfect acquaintance with French. 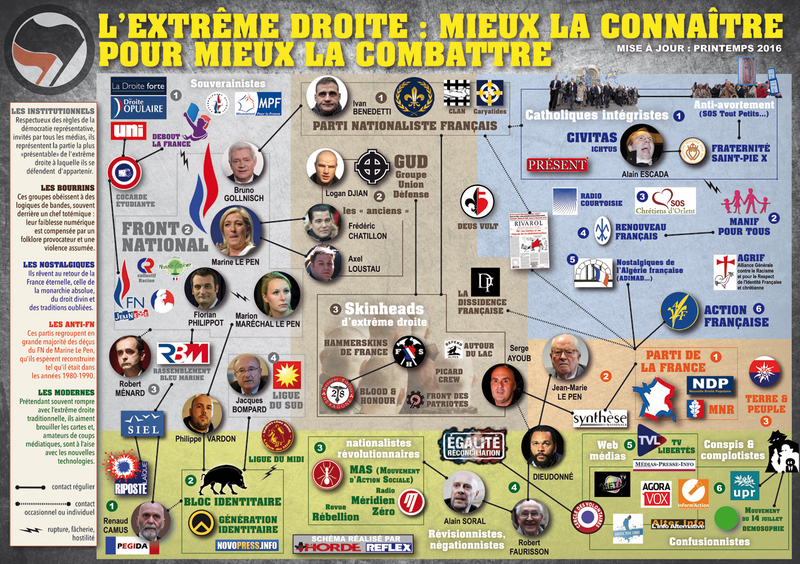 There are, as the organigramme of the French far-right (above) indicates, many many groups, and this is just one, a marginal one. The Boradcaster did not contrast the couple of thousand strong identitaire demonstration they showed with the over 100,000 moblised in Paris this Sunday by La France insoumise or the over 20,000 who attended the rally for Socialist Presidential candidate Benoît Hamon. « George Galloway to Stand – for Pirate Party? – in Manchester Gorton By-Election.